At Intersport Elverys, we are part of the fabric of GAA in every county. Through our support at club level, our retail partnerships and our county sponsorships, we share the passions of fans and players alike. Like you, we look forward to every minute of the championship. 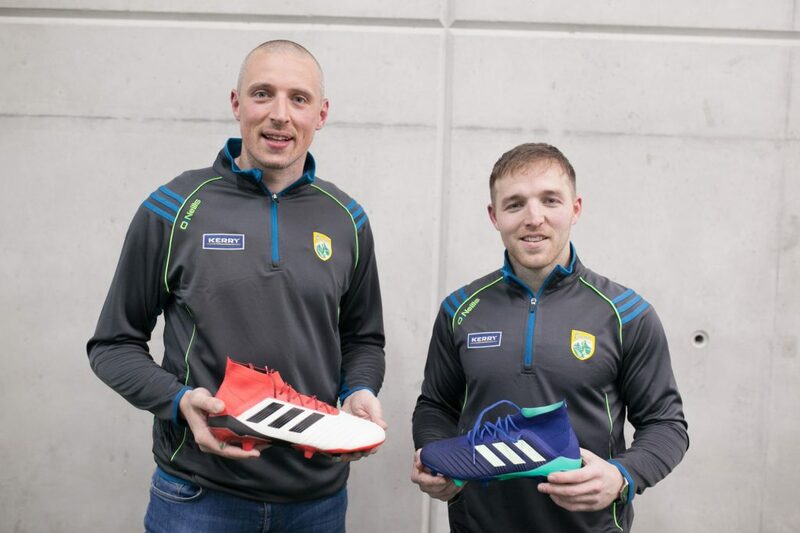 As official retail partner of Kerry GAA, we travelled down to their state-of-the-art Centre of Excellence in Currans and in tow, we had the latest adidas from the Deadly Strike pack to dish out to the inter-county stars. Kitting Kerry’s finest with their Championship boots. Our passion for GAA is reflected in the fact that we are proud title sponsor of Mayo GAA and Tipperary GAA as well as retail partner to EIGHT other inter-county teams. We have become the destination for boots for this Kerry squad, supplying them with the latest and greatest boots to suit their style of play. We understand that having the right footwear is an important part of any inter-county player’s game as these players strive for greatness on the field. Kerry’s commitment and dedication to the game got them to where they are and we’re proud to be backing them on their journey. Click HERE and below see our huge GAA boots range or call in-store to get the best fit for that GAA star in your life! WATCH OUR KERRY BOOT DROP VIDEO BELOW!